Paul Menard and the No. 21 Menards/NIBCO team had a case of the second-round blues during Monster Energy Cup Series qualifying at Kansas Speedway Friday evening. 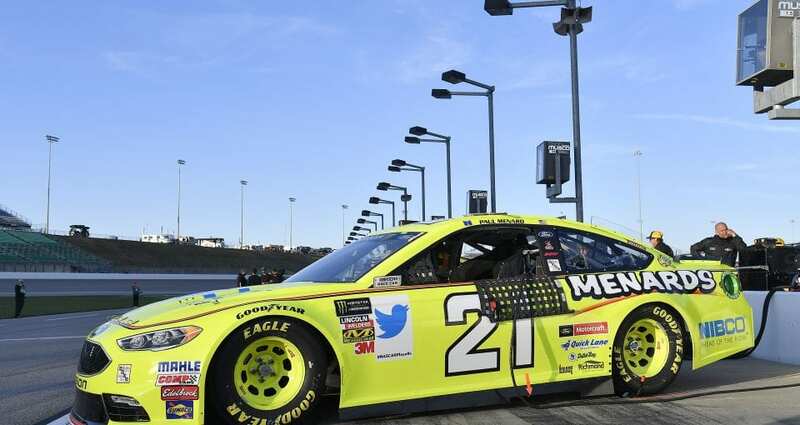 After posting top-10 speeds in opening practice and the first of three rounds of qualifying, Menard was just 18th fastest in the second round and therefore not among the elite 12 who ran for the pole. Menard was seventh fastest in opening practice on Friday with a speed of 191.130 miles per hour. Then in Round One of qualifying, he toured the 1.5-mile track at 189.720 mph, which was ninth on the speed chart. Then in the second round, he ran a lap at 189.122 mph on his third lap, which left him 18th in a starting line-up that features a Ford driver, Joey Logano, on the pole followed by four other from the Blue Oval contingent in the top five. Menard and the Menards/NIBCO team have two practice sessions on Saturday to fine-tune their No. 21 Fusion for Sunday’s Hollywood Casino 400. Saturday’s practice sessions – at 10:30 a.m. Eastern Time and 1:05 p.m. Eastern – will be broadcast on CNBC and NBCSN respectively. Sunday’s 400-miler is scheduled to start just after 2:30 p.m. with TV coverage on NBC.